1.Chlorine Reduction:Tap water can often contain contaminants like chlorine and trace pharmaceuticals,Pursafet water filter can help remove bad tastes and odors. 2.Heavy Metal Reduction:Pursafet water filters ensure reduction of heavy metal such as mercury and lead which is found in drinking water in certain areas of the country or when using older pipes for transportation. 3.Microbial Cysts Reduction:With the changes in the climate and environment, different microbial cysts in drinking water had been found.Pursafet water filter has a effective reduction for cysts. 4.Industrial Chemicals Reduction:People all over the world are using drinking water which is on unsafe levels of a widely used class of industrial chemicals linked to potentially serious health problems.Pursafet Water filter offers a high industrial chemicals-adsorption rate. 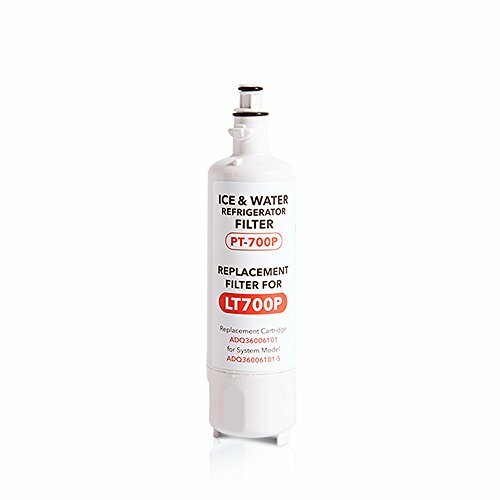 We recommend replacing Pursafet water filter 6 months or 200gallon. You can replace this filter sooner if you notice the water flow is slowing down or the water color becomes darker. - NSF certified: Tested and certified by NSF International against NSF/ANSI Standard 42 for chlorine, bad taste and odor reduction. - Intelligent reminder: A professional fridge filter indicator is also included in our new package, which will remind you to replace the filter on regular basis. You will not miss the best moment to replace the filter any more. If you have any questions about this product by Pursafet, contact us by completing and submitting the form below. If you are looking for a specif part number, please include it with your message.